When I was 10 years old I began to learn the violin in high school (Gymnasium) in Germany. I discovered my dream vocation when, at the age of 13, I visited a violin maker’s workshop in the Bavarian Forest for the first time, looking for a first violin of my own to buy. 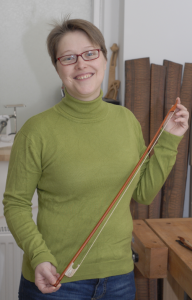 Once I had passed my school leaving certificate (Abitur), I began to train as a maker of bowed string instruments at the Federal Higher Technical Institute (HTBLA) in Hallstadt, Austria, successfully completing my training in 2003. During that period I also discovered a love for Baroque music and for historical performance practice. In 2003 I began to work with bow maker Scott Wallace in his workshop in Vienna, where I learned to make bows. I have been working independently in my own workshop in Vienna since 2012 and my main field of activity is making copies of historic bows.